We live in a world where everything is increasingly digital – digital products, digital services, digital everything! 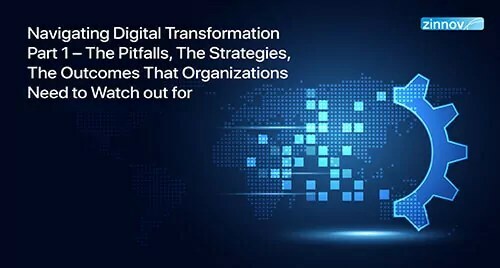 Every vertical you can think of is being disrupted by digital technologies and almost every firm is moving towards becoming a digital company. New-age technologies such as AI, ML, IoT, Robotic Process Automation, and Blockchain are pervasively being adopted across industries. This is only expected to increase manifold in the future. The overall R&D spend has always been consolidated, with the top 100 spenders accounting for nearly ~61% of the Z1000 R&D Spend (Top 1000 R&D Spenders globally). However, the top spenders have been suffering mortality and are being replaced by newer firms which are primarily digital natives. In the wake of disruption and to stave off competition, large traditional R&D spenders are investing heavily in digital engineering capabilities to keep up with the rapid change. We spoke with Sivaram S, Engagement Manager, Zinnov Zones, regarding the evolving state of the ER&D market, the impact of digital engineering on ER&D, and the resultant opportunities and challenges that lie ahead for Service Providers. What is Digital Engineering and what is its impact on the ER&D ecosystem? Digital Engineering can be viewed as a means for organizations to either “modernize the old” or “Build the new” through new and connected products and services. When I say enterprises are investing in Digital Engineering, it also covers the spend on digital infrastructure to modernize the product launch process for e.g. Factory 4.0. Companies are betting big on digital engineering initiatives to enable alternative revenue streams and stay ahead of the curve. A huge chunk of the ER&D spend is moving towards digital engineering components. 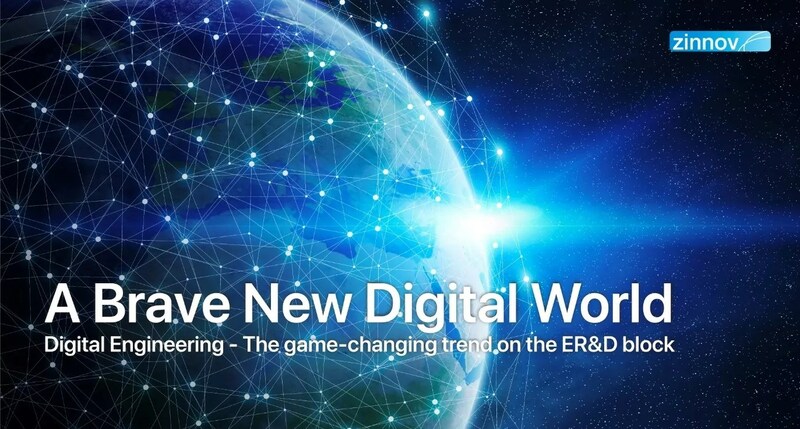 Currently, digital engineering accounts for nearly one-fourth of the total global ER&D spend. 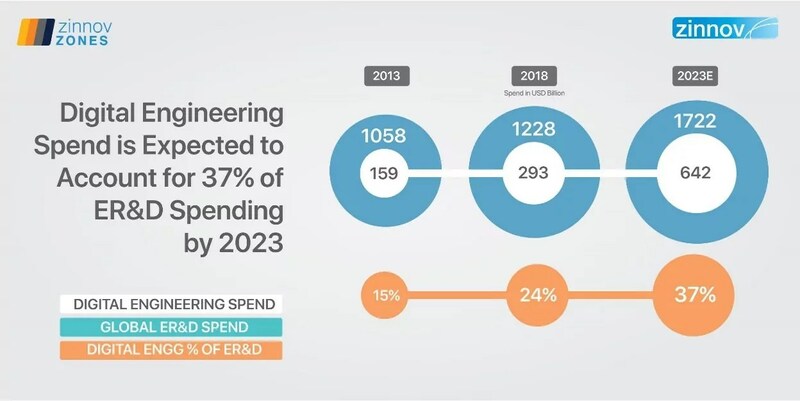 Given the continued focus on digital engineering, this portion of the pie will double in size and account for ~37% of the overall ER&D spend by 2023 as per a recent Zinnov analysis. What are some of the ER&D trends that have emerged over the past few years? Clearly, companies across verticals have targeted priorities. If I think of the Software & Internet space, enterprise software firms are focusing on faster time to market through investments in DevOps engineering. Further, they are foraying into verticals that were hitherto non-core to them, such as automotive; for e.g. Google’s self-driving car. When it comes to the automotive sector, there is a clear focus on developing intelligent and autonomous capabilities in vehicles. In the healthcare space, value-based care and preventive care have climbed up the priority list of top executives in firms. One common theme that has emerged across all verticals is that newer use cases and products are being explored through investments in digital engineering technologies. What are companies doing to prioritize their Digital Engineering initiatives? Enterprises have been focusing on strategies to maximize benefits from digital engineering initiatives. We expect a lot of concentrated investments in terms of establishing CoEs and centralized teams to drive digital engineering initiatives throughout the firm. External partnerships to build an open innovation fabric will be pivotal to successful digital transformation. Firms are also looking to acquire capabilities. For instance, Ford and Toyota are investing heavily in autonomous driving and AI. Ford has earmarked ~ $4Bn in building autonomous capabilities, CoEs, and acquiring multiple smaller firms by 2023. 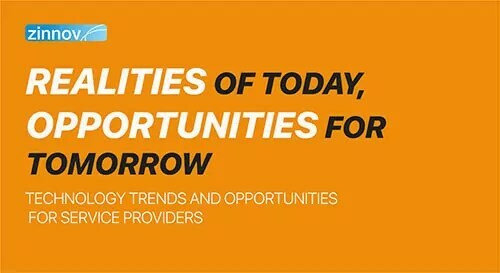 What are some of the opportunities that Service Providers need to watch out for? The ongoing disruption provides ample opportunities for the Service Provider community across initiatives. 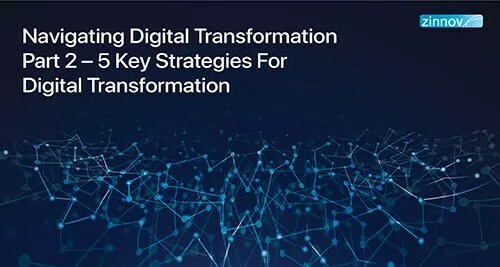 As enterprises look to “build the new,” Service Providers with robust digital engineering capabilities find themselves poised to assist them in their transformation journey. While Service Providers focus on building newer capabilities, there is also a significant opportunity for companies to carve out specific products and functions from large enterprises, wherein an enterprise would hand over a significant chunk of their legacy product portfolio to the Service Provider for an end-to-end PDLC (Product Lifecycle) management. The IBM – HCL partnership is a case in point. HCL is responsible for end-to-end PDLC of IBM’s legacy products such as Tivoli and Rationale. Such deals are typically catered to by large Service Providers who have the ability to scale. What is that one significant change that has altered the ER&D landscape in the last few years? There is a significant uptick in digital engineering adoption across verticals. For instance, a couple of years back, many IoT-led projects were stalled at the PoC/pilot stage itself. However, the “crawl-walk-run” approach adopted by enterprises in an agile iterative fashion seems to have instilled confidence and alleviated concerns around RoI. Further, enterprises are also experimenting with newer use cases and are looking to generate business outcomes through digital engineering adoption. Perhaps one of the biggest trends that we have seen is that enterprises are increasingly leveraging the Service Provider community through innovative mechanisms for end-to-end PDLC of legacy products. These “carve-outs” of legacy areas are enabling enterprises to focus on new-age initiatives. What are some of the challenges that ER&D Service Providers are looking at? 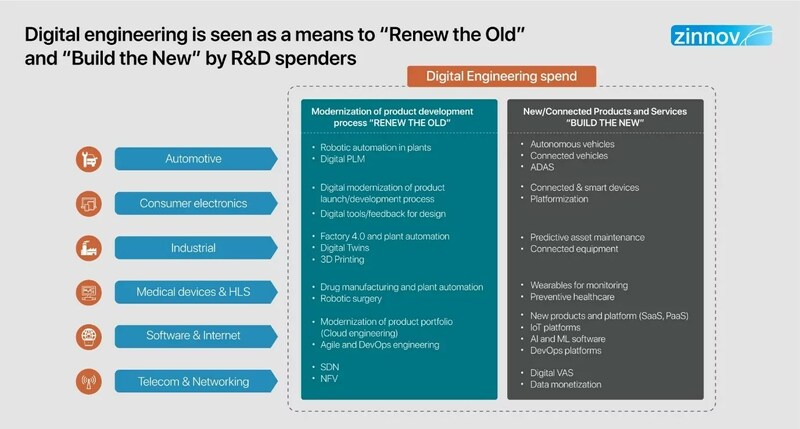 To ride on the Digital Engineering growth wave, R&D spenders are seeking to build foundational digital blueprint that will enable agility and velocity while driving outcomes. Service Providers need to be continually looking for opportunities and building newer capabilities to stay ahead of the competition. 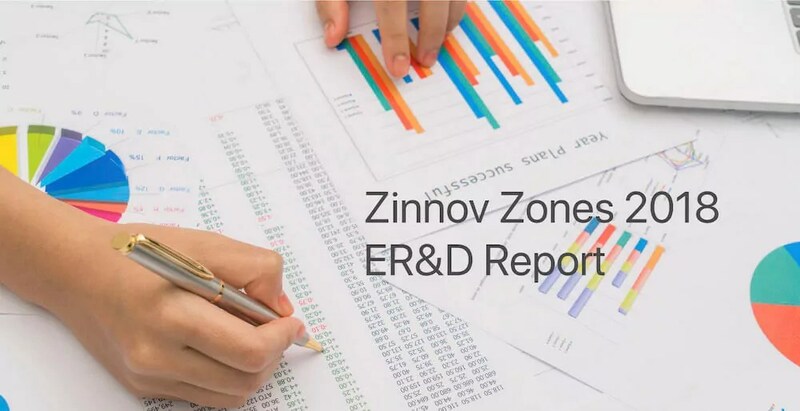 Zinnov Zones has been tracking and analyzing the ER&D space for more than a decade now. Every year, we publish a comprehensive report that encapsulates the entire ER&D landscape and rate global Service Providers on their ER&D capabilities. This year, we have assessed ~40 global ER&D Service Providers for their overall ER&D prowess. 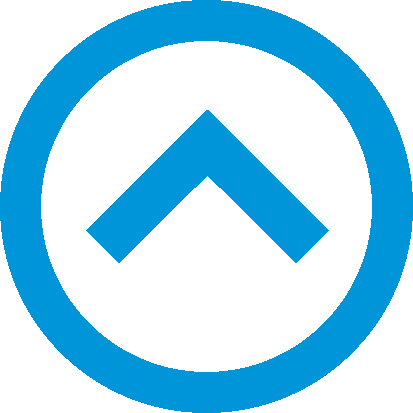 Additionally, we have analyzed them for vertical-specific capabilities as well as new age services such as AI and ML engineering, UX engineering, and platform engineering. 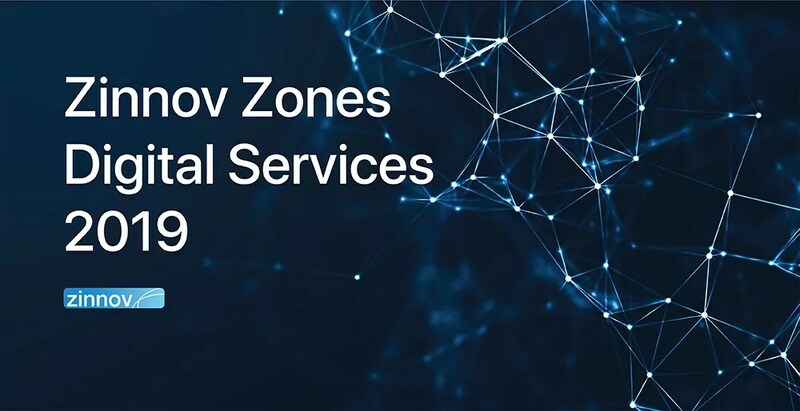 Get access to the latest Zinnov Zones report here.